"I love summer jobs," Duk Luitel told me as she paused from clipping clusters of grapes on the vines surrounding Shelburne Vineyard. It feels good to be working outdoors, she explained. After all, the 41-year-old Winooski resident was a farmer in her native Bhutan. Luitel is among a group of about 30 people, most of them from the Bhutanese community, who have been picking grapes at the vineyard since the harvest season started earlier this month. A smaller number of Congolese are also pitching in at the vineyard on Route 7. For the past three years, co-owner Kenneth Albert has depended on his personal connection with a Bhutanese individual to recruit grape pickers from that community. "They are more reliable," he said. "Local residents [are] doing it as more of a recreation." It's not uncommon for those who work at the nearby Vermont Teddy Bear Company to stop in and ask about harvesting work, Albert added. Josh Stecker, assistant wine maker and vineyard manager, feels the same way about the New Americans' contribution. "They are absolutely essential to our success," he said. Like other vineyard employees Ethan Joseph and CJ Buzzy, Stecker is a University of Vermont graduate. He said the pickers start work at 7 a.m. and, depending on the weather, might finish as late as 4 p.m. Lunch and snacks are provided. But not everyone works the full day because of other jobs. Luitel works up to three days a week at the vineyard, four to six hours at a time. In the evening, she pulls an eight-hour shift as a housekeeper at the University of Vermont Children's Hospital. 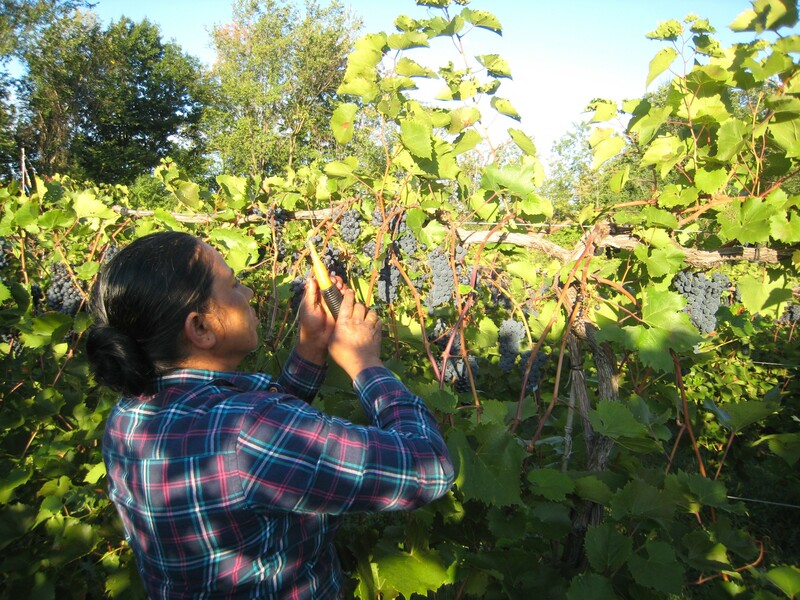 Grape picking is easy, Luitel said, though she never grew the fruit in Bhutan or Nepal. That's where she lived for 18 years after she, along with thousands of Bhutanese of Nepali descent, was expelled from Bhutan in the early 1990s. Luitel has a car, so getting to the vineyard is not a problem. She also offers rides to four other friends. But Albert pointed out that the vineyard is one of few farms in Vermont on a bus route, making it accessible to those who don't drive or have another way to get to work. Seventy-year-old Saran Chhetri is one of those who takes the bus to work. 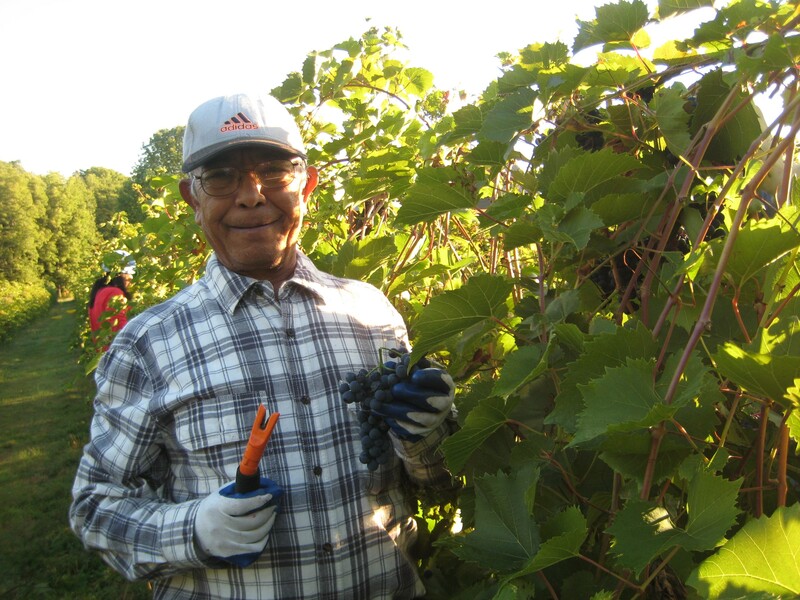 A Bhutanese gentleman who came to Vermont in 2010, he works four to six hours at a time at the vineyard. When the Winooski resident isn't at the vineyard, he potters around at the O'Brien Community Center Garden, cycles around his neighborhood or joins religious ceremonies organized by the Vermont Hindu Temple. Chhetri isn't the only septuagenarian at the vineyard. Former college professor and retiree Lisa Newton is writing a book on urban agriculture and considers grape picking part of her research. Like the other pickers, the 77-year-old resident of Wake Robin Continuing Care Retirement Community enjoys being out in the sun. Although she now works side by side with the Bhutanese, her interaction with them is limited to "Hello," "Good morning" and "Can you help get those grapes for me because they're too high?" But Albert said that language is not a barrier when it comes to teaching someone how to pick grapes. "As long as you're willing to be focused and diligent, anyone can do it," he said. The grape harvest season ends on October 1.